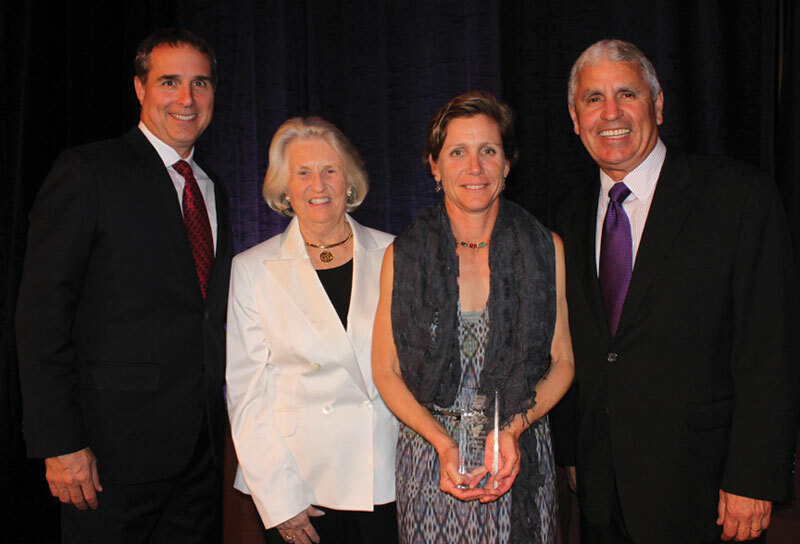 Rita Gladstone, of Port Orange, Florida, was presented the PTR/USTA Service Award. Recently, Gladstone was named the USTA National On Court Trainer of the Year, an honor bestowed on an individual who promotes the growth of tennis through exemplary on court training, assists the national office with the direction of the program, and is very well connected with their section’s efforts. A grassroots tennis advocate, Gladstone serves at the National and Sectional levels of the USTA. She is a member of the 10 and Under Tennis Task Force and serves as Vice Chair of the Junior Team Tennis Committee. Very active in her home state of Florida and in her community, as an RCW Trainer, Gladstone conducts tennis training for physical education teachers and afterschool program providers. “Rita Gladstone has had a remarkable impact on the game of tennis and her commitment and enthusiasm are unparalleled,” said Kurt Kamperman, USTA Chief Executive, Community Tennis. Gladstone has been a trainer, coach, volunteer and player for more than 30 years. She played tennis for the University of South Carolina from 1984-88, and her 127 wins remains an unbroken school record.